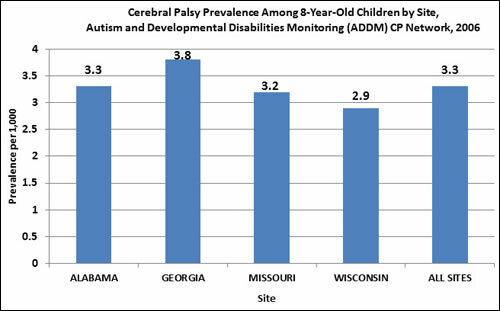 Center for Disease Control and Prevention (CDC) conducts cerebral palsy (CP) tracking or surveillance programs in different populations across the United States. These programs collect information about the characteristics of children with CP, serve as the basis for future research and inform strategies for prevention. There were 142,338 8-year-old children in the population from Alabama, Georgia, Missouri, and Wisconsin, representing approximately 4% of the U.S. population of 8-year-olds. CP prevalence varied by site, ranging from 2.9 per 1,000 8-year-olds in Wisconsin to 3.8 per 1,000 8-year-olds in Georgia. The average prevalence of CP across the four sites was approximately 3.3 per 1,000 or 1 in 303 8-year-old children in the United States. CP prevalence was significantly lower among Hispanic children than among Black or White children. The prevalence among White and Black children varied across the sites. Spastic CP was the most common type of CP, found among approximately 80% of children with CP. CP, on average, occurred 1.2 times more frequently among boys than among girls. Three ADDM sites participated in the previous 2002 surveillance year (Alabama, Georgia, and Wisconsin). The average CP prevalence across these three sites in 2002 was 3.6 per 1,000 8-year-olds. This was not meaningfully different than the average prevalence across the three sites in 2006 (3.4 per 1,000). In 2006, 56% of children with CP were able to walk independently, while 33% had limited or no walking ability. Nearly one-quarter of children with CP had both intellectual disability and epilepsy.